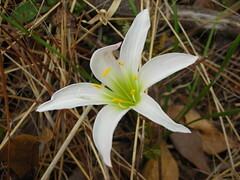 Easter lilies, growing in the woods. Update: What Are Those Lilies? Hey, did you take that one? Nice. I had a spider lily growing under my gas meter when I lived in Valdosta several years back. It was a pleasant surprise to find it. Gretchen took them. I just added a couple more lily pictures from a walkabout today.